Innovation, by its definition, means bucking tradition. Thinking outside the box. Doing what hasn’t been done before—what isn’t “normal.” Andy Lipkis, founder of TreePeople, spent much of the beginning of his career oscillating between his desire for normality and his need to do world-changing work. Bioneers, he says, was integral in his gravitation toward the latter. When Lipkis was starting his career, he had big ideas but lacked the financial support he needed to get them off the ground. As a teenager, he was passionate about finding ways to restore his local California forests. While attending a summer camp with a forest-restoration program, he saw immediate potential: Kids at summer camps throughout California should be able to take part in tree-planting initiatives. Lipkis followed a winding road through several failures (what he calls “failure compost”) and a couple of big successes to finally fund what would become the California Conservation Project: the early nonprofit that would eventually become today’s TreePeople. The support of those close to him, he says, was key. “Something that my parents did—and it’s what Kenny and Nina are doing in a macro kind of way—is when I had a weird idea, they didn’t judge it. They said, ‘How would you do that?’” Lipkis says. Getting people working together on a small scale to plant trees was Lipkis’ first big success, but it was far from his last “How would you do that?” experience. Through a deeper connection with his Los Angeles community, he started to notice how broken the social and city systems around him had become. He saw agency leaders working largely in isolation from one another and infrastructures designed to treat humans as simple-minded consumers rather than integral participants. Lipkis envisioned a better Los Angeles—one that wasn’t a piece of dirt, but a living ecosystem, similar to the forests he loved. It would require biomimicry at a deep, systems level. To start, and armed with the knowledge that people care for what they sow, he was determined to find ways to bring his community together with purpose. Starting with two massive floods in the late 70s, Lipkis’ ability to mobilize people proved powerful. So powerful, in fact, that city leaders began calling on him to find strong bodies to help mitigate the destruction. He discovered within himself an aptitude for grassroots organizing, but also substantial respect for the people around him. If he could organize people for flood response, he thought, he ought to be able to organize them to support and solve other problems. In the early 80s, information about global climate change and its effects was starting to be widely disseminated. The 1984 Summer Olympics were held in Los Angeles, and the city had a serendipitous goal of planting 1 million trees before the events began. Lipkis joined forces with government agencies, private corporations, and volunteers to reach the city’s goal, creating an astounding, replicable model of citizen mobility for a worthy cause. 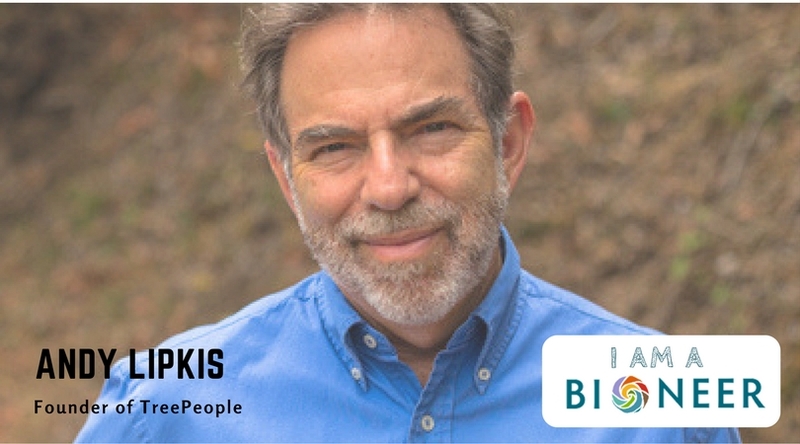 By the time he attended his first Bioneers Conference as a workshop speaker in 2002, Lipkis had become an expert in grassroots organization and was making impressive gains in the world of urban planning. Over the course of more than ten years, he continued to speak at subsequent Bioneers events, finding that the community often gave even more back to him than he gave it. Today, Lipkis and TreePeople continue to use forest-inspired technologies to heal and bring together Los Angeles, which they hope will become a model for many other cities in the future. (Read more about his current work in Bioneers’ Climate Leadership e-book, starting on page 30.) While ingenuity and thinking outside the box have been essential to his achievements, Lipkis says, it’s average people that create the biggest waves. Stay up-to-date on what world-changing Bioneers like Andy Lipkis are accomplishing by signing up for our newsletter.